For the Eurocircuits “New – Assembly service” we require the customer to provide both BOM & CPL files, these are necessary in order to provide accurate pricing and also for the actual assembly off the PCB. Uploaded files – files which are uploaded to and saved in a specific Basket number on Eurocircuits web server. Imported files – files which are actually imported in to specific Basket number on the on Eurocircuits web server ready to be used for the assembly of the PCB. Please see our How to Upload or Import BOM & CPL files -User Guide. Can I also use my known EMS-partner for the assembly? If PCB is manufactured by Eurocircuits and data has been processed through our PCB Visualizer and PCBA Visualizer, there is the option to transfer the prepared PCBA data to one of Eurocircuits EMS-partners. Please contact us for more information on our EMS-partners. What does the EMS partner network stands for? EMS stands for Electronic Manufacturing Services and is a term used for companies that design, manufacture, test, distribute and provide return/repair services for electronic Industry. We have developed and expanded our EMS Partner Network to provide addition services to our customers. We are continuously developing our partner network to ensure we offer the right services to our customers. Please contact us for latest EMS Partner information. Why work with EMS Partners? Working with EMS Partners allows Eurocircuits to offer its customers an enhanced range of Electronic Assembly Services with greater flexibility. Where can I find Eurocircuits quality labels ? All our quality certificates or our production units can be found on the download page. Where can I find Eurocircuits statements concerning RoHS, REACH, etc. ? Where can I find the manuals etc. of the eC-equipment ? All manuals, safety instructions and software for our eC-equipment can be found on the download page. Where can I find the specifications for materials etc. ? All our specification sheets for base material we use, the soldermask we apply etc. can be found on the download page. Answers to "what does it mean that ..."
The Annular Ring value is defined as the amount of Copper from the edge of the Drilled Hole to the Copper Pad associated with the hole. OAR – Outer Layer Annular Ring – for more information click here. IAR – Inner Layer Annular Ring – for more information click here. Also see our PCB Design Guidelines section on Holes. CHE NI/AU Selective/Overall. Which should I specify? For more information please see our Which Surface Finish fits your Design page. Outer/Inner layer copper foil? Start and Final copper thickness? Copper foil is the starting thickness of the copper of any given layer of the PCB, choosing the correct thickness depends on the design and may be different for Inner and Outer layers on the PCB. Please see our PCB Design Guidelines Classification section for more information. 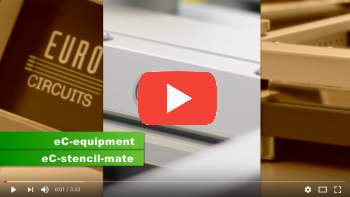 Wim De Greve, head of development for Eurocircuits explains how the PCB Configurator works, and what functionality is available for electronics engineers to configure and visualise their boards before placing an order. If you have received the message “Pooling conditions no longer met” then there are parameters of your design that make it impossible to pool with Other PCB’s, this may result is an increase in price. Please see our Pooling Conditions No Longer Met and The History of Order Pooling for more information. Via Holes have a tolerance of +0.10/-0.30mm and maybe reduced to accommodate for a larger annular ring. 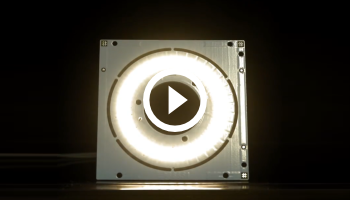 Drilled Holes in the PCB – all you need to know to avoid surprises. For PCB’s the main standards are UL 796, the specific PCB standard, and UL 94 for flammability testing of all plastics. These specify a number of performance tests to measure the long-term reliability and fire safety of the PCB. If a board is released to these standards, it is marked with the UL logo, the fabricator’s logo and the board type. For more information please see What About UL? on the Eurocircuits website. Can we have Paper Invoices sent by Post? Send Invoices to a different Person/Address? 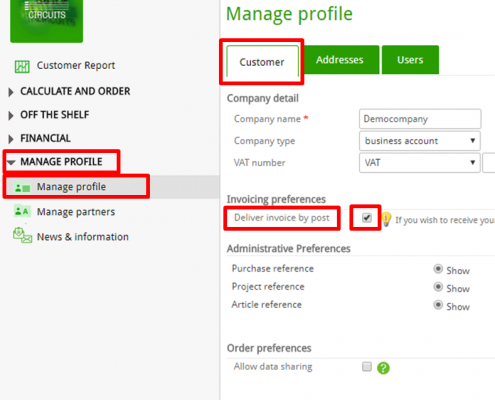 To manage how, where and to whom your invoices are sent please first Sign In to your account. 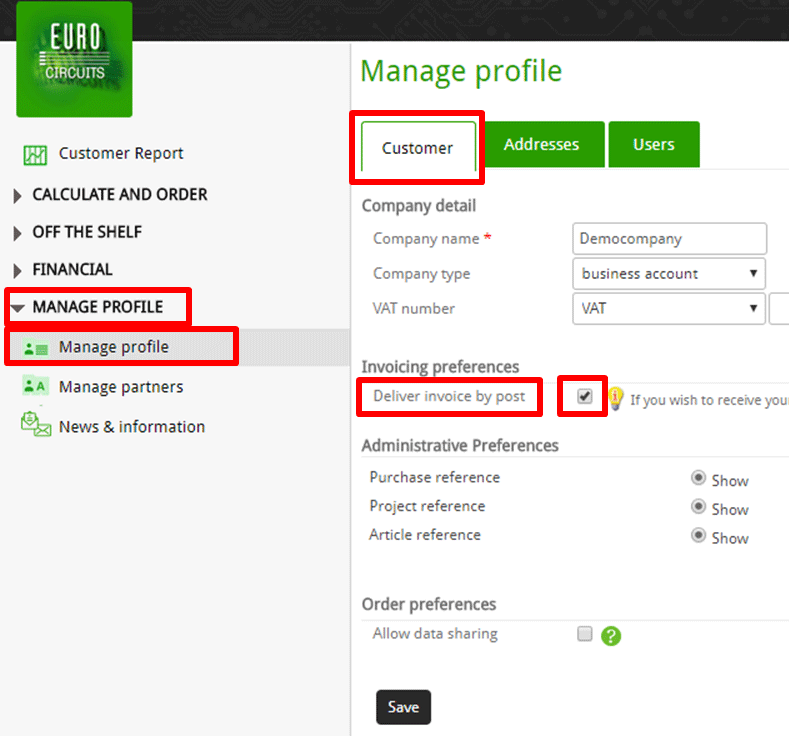 Once you have signed in expand the “Manage profile” menu on the left, then select “Manage profile”, this opens in the “Customer” tab. In the “Customer’ tab make sure the “Deliver invoices by post”checkbox is checked. Remember to “Save” any changes. Select the “Addresses” tab and then select the “Invoice Address” from the list below. 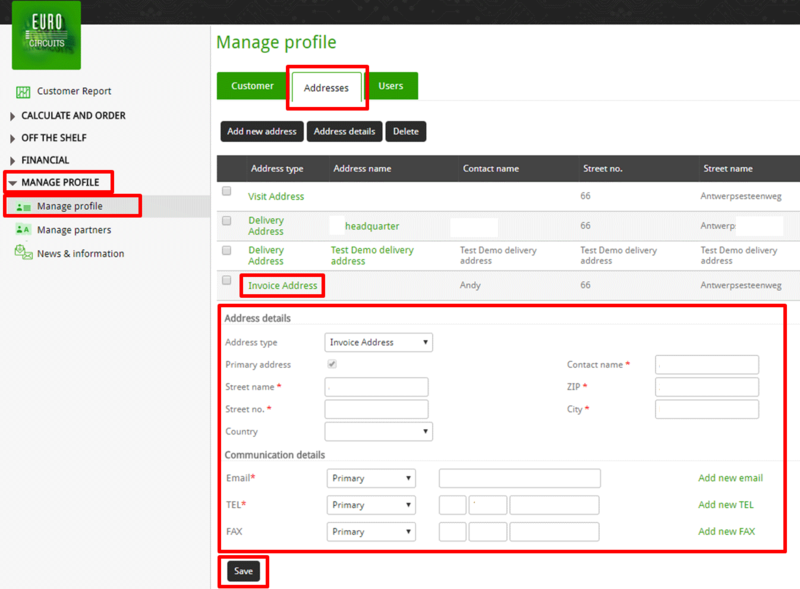 This will open a form where you are able to update the address and contact details to where the invoices should be delivered. How can I add new users? To add a new user first Sign In to your account. 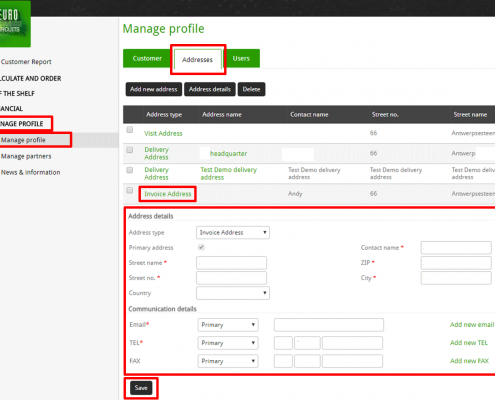 Once you have signed in expand the “Manage profile” menu on the left, then select “Manage profile” from the menus. Next select the “Users” tab, here you will see a list of current users, just above these select the “Add new contact” tab, once selected a new contact form will open below, complete all fields marked with * in both the “Contact information” and “User information” tabs. Remember to save your changes by click on the “Save” button at the below the form. How do I find and pay my invoice? 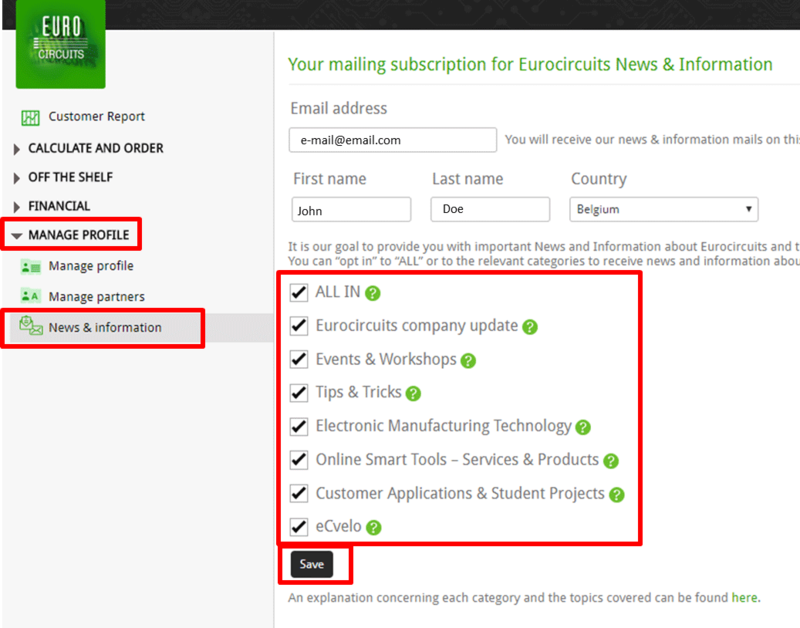 To find your Pending invoices first Sign In to you Eurocircuits account. 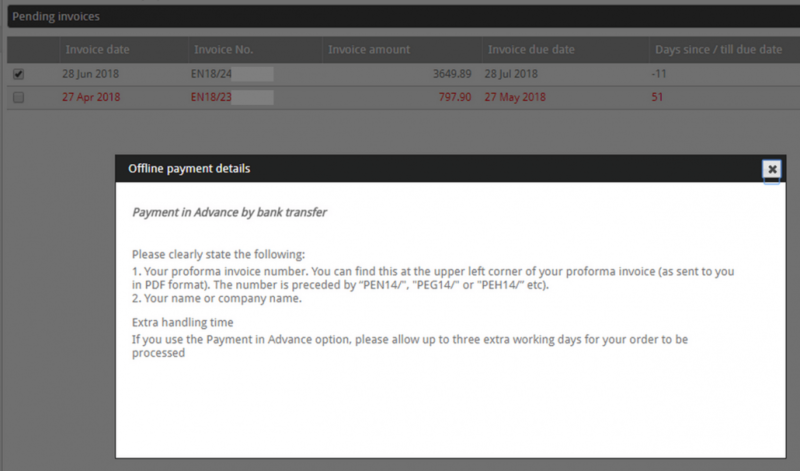 Then select “FINANCE” from the left hand side menu, then select “Pending invoices”, this will show a list of open invoices to be paid. You are able to pay an invoice either by using the Online secure payment service or the Offline option. To use the Online option first check the box of the invoice to pay and then select the “Online payment” button at the top of the window. This will open a pop-up window informing you that you will be redirected you to our online secure payment gateway, click OK. When the gateway opens select your preferred method of payment and follow the instructions. To use the Offline option select the “Offline payment” button at the top of the window. A pop-up window will open with the instructions of how to pay the invoice offline. You can find Eurocircuits bank account details at the bottom of your invoice. What is my credit limit? My new order will put me over the limit: What can I do? If you have a question, please contact our CHAT support team. Where can I set my mailing preferences? To change your mail preferences first Sign In to your account. 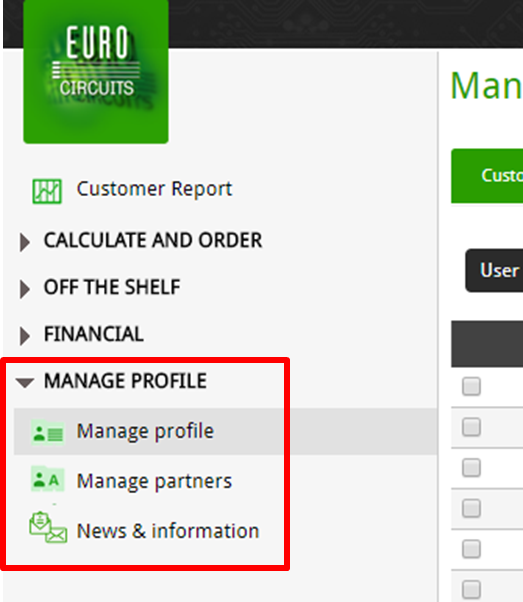 Once you have signed in expand the “Manage profile” menu on the left, then select “News & Information”, from there you are able to manage your preferences. Remember to “Save” your changes. Where do I manage my customer profile? 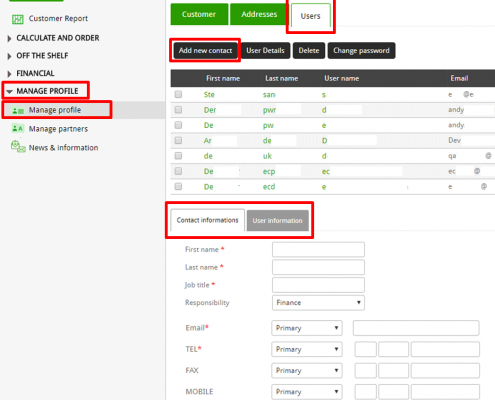 To manage your customer profile first Sign In to your account. 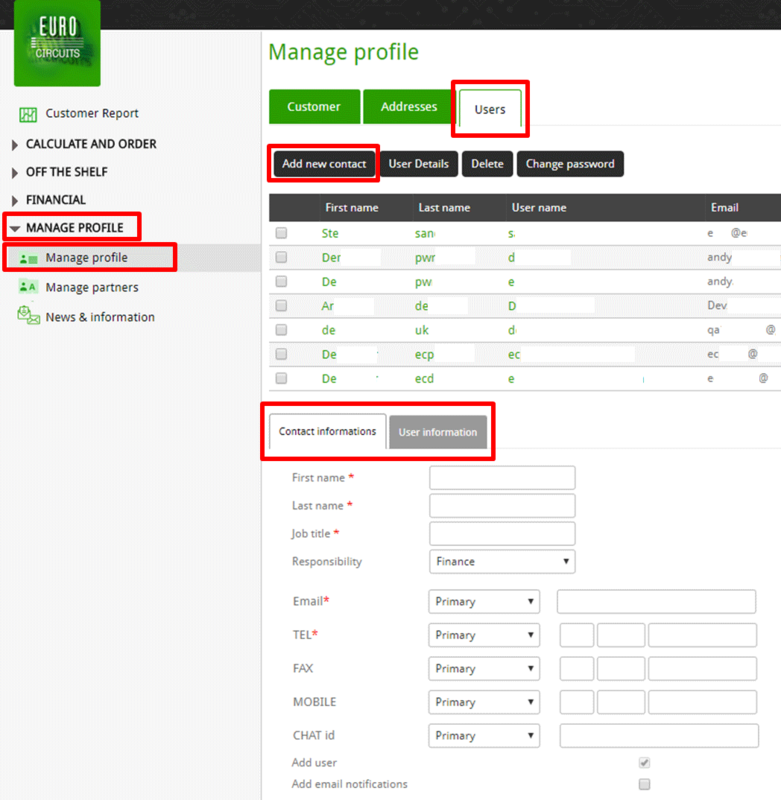 Once you have signed in expand the “Manage profile” menu on the left, then select “Manage profile”, from there you are able to manage your customer profile. Will I be Invoiced with VAT? This is nicely explained on this page. How to become a Eurocircuits customer and place place your first order. Can I order PCBs if I am not a company? You can register a Private account or a Business account. If you or your company are VAT-registered include your VAT number. In many European countries we can then invoice you VAT-free (more). Do I have to pay up front for my first order? There is normally no need to pre-pay for your order. We will send you an invoice by email when we have delivered the boards. How do I get a price? Do I have to register as a user? On our web site home page, in the right upper corner you will find 2 option to calculate a price. FAST price will calculate you a rough idea of price for any quantity of boards, based on standard FR-4 base material and standard PCB technology. PCB Calculator will take you to the service selection page where you can find all possible services and specific calculators. Help in making your choice here. You can make all calculations you want and take benefit of our smart calculator who will validate all chosen technical options for you. So no need to study all our capabilities first, our smart calculator will prevent you from making mistakes. It is only from the moment that you wish to save your calculation in the shopping basket that you will be asked to login or give your details for registering. From that moment on you can also profit from our PCB Visualizer and have the software analyse your data (DRC/DFM). Just attach your PCB data to the calculation after login and before you save it to the basket. Chat – on every page of our transaction web site you can activate the online chat button. You will see us online during office hours. You may also use this communication to leave your message while we are offline. It is efficient as we can see where in the web site you are and who you are, so we can help you faster. Tf – +32 15 28 16 30 for the Belgian main office. For local offices look here. You can pay online or by bank transfer. To pay online, log in and go to the Financial tab, select the invoice(s) you want to pay and click online payment. Payment by bank transfer is different in different countries. More. Note: do you need to pay VAT? See here. How do I place an order? Can I place an order as soon as I register? To use any of our services, enter the board details into the online Price calculator and calculate the price. Attach the data and put the order in your basket (you can use PCB Visualizer to check all details and view your PCB already). Proceed to checkout and you will be asked for your (company) name, address etc. You can register a Private account or a Business account. If you or your company are VAT-registered include your VAT number. In many European countries we can then invoice you VAT-free (more). Place your order. We will check the details provided while our engineers are checking your data. If everything is OK, we will open a QuickStart credit account for you and proceed with your order without delay. You don’t have to pay up-front. We will invoice you when the goods are shipped. If opening PCB Visualizer I receive the message that my browser is not supported. I’m using Internet explore 8.0.6001… on a Windows XP 32bit PC. I get the message that I need a more recent version of my browser. PCB Visualizer is using HTML5 code. This code is not supported by older versions of Internet Explorer. In Windows XP you cannot upgrade to version 9 or 10 of Windows Explorer, so the only solution is to try another browser. We suggest Firefox or Google Chrome, these are the most common browsers used by our customers (based on our google analytics data), and we most actively debug PCB Visualizer on these two browsers. What is the fastest delivery? The fastest delivery term depends on the chosen service and even more on the chosen technology. The fastest we offer is 1 working day in our NAKED proto service covering 1 and 2 layer boards without solder mask or legend and in quantities of 1, 2 or 5 PCBs. Which PCB service should I choose? First you should decide for the base material to be used for your PCBs. FR-4 is the standard base material but we can also offer other material for specific application which are plced under special base materials. NAKED proto – basic prototype pooling service. Quick & dirty. PCB proto – dedicated prototype pooling service. BINDI pool – Eurocircuits’ Asian alternative with European assured quality. 2 and 4 layer boards with standard technology in medium quantities at Indian cost but inhouse produced in India. SEMI-FLEX pool – flex-to-install flex-rigid pooling service. Something brand new to replace rigid -flex boards in flex-to-install applications and at pooling prices for our 4 layer offer. Need aluminium-backed boards for cooling purposes. Prototypes and small series at acceptable prices due to pooling conditions. You cannot find what you are looking for here? How to answers questions to do things "right first time". How can I check that my data is correct before I place my order? Log in to your customer account on our web site (or create an account), then upload your data into the PCB Visualizer and check the data using the PCB Configurator and PCB Checker. Please follow the link below for our guidelines on how to create and order a customer panel. How do I order a Stencil? 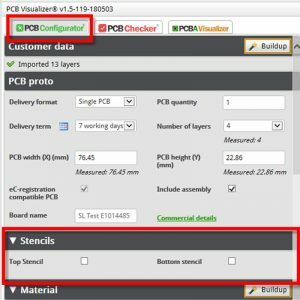 Once your data is uploaded to the Eurocircuits PCB Visualizer you able to select the Stencil section of the PCB Configurator and choose Top, Bottom or Both Stencils. You are also able to edit your Solder Paste data using our New Solder Paste Editor in the PCB Checker tab. How do I specify a multilayer build? The build-up of the PCB is usually predefined when you upload you data files to the Eurocircuits PCB Visualizer. If this is not possible or you need an alternative build you can use our Buildup Editor in the PCB Configurator. Here you can select from our predefined builds or if necessary request a special build. How do I specify internal slots (plated or non-plated) and cut-outs? Complex profiles? Do they cost extra? How do I specify UL marking? Does it cost extra? You can add all types of markings including UL using the Eurocircuits Marking Editor, follow the link below for instructions. These may increase the cost of the PCB. Questions related to the logistics. Changing the delivery address for a running order is possible until the status of the order says “Production Finish”. How to do this? Select the order and click the black button “modify order”. Now select a different delivery address from the drop down list. If you want to ship to an address, which is not yet appearing in this dropdown list, please contact the power user of the account. He can create a new delivery address in this dropdown list. (He can do this via “manage profile”). Can I change the Order Quantity? Change the delivery date? Cancel my order? Upload new data? This depends of the status of your order. If the preparation of the data is already finished or if the order is in production, no changes are possible anymore. Go to your “running order” list. Select the order by checking the box on the left. 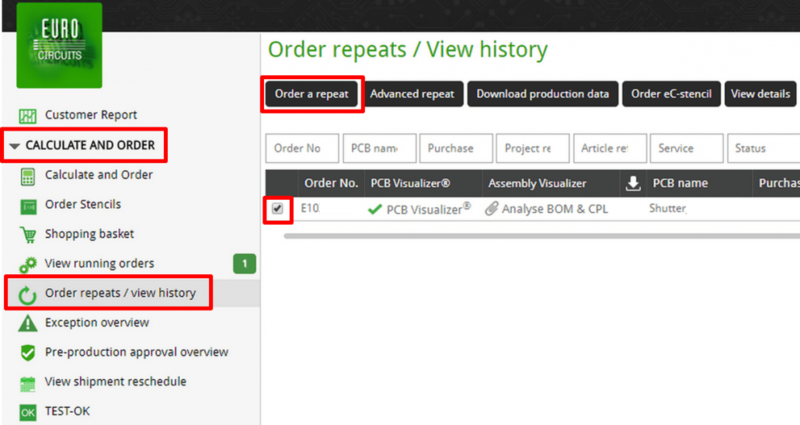 Click the black button “modify order” on top of the page (Important tip: don’t do this by clicking on the PCB Visualizer, no changes can be saved via PCB Visualizer for a running order !). The system will tell you if the order can still be modified. Check out the item again to re-order and verify if it re-appears now in your list of “running orders”. If it does, it will have a new order number and you will be sure it is back in process. Can I verify the production data before Eurocircuits starts manufacturing? Not sure about your artwork or how our engineers will interpret it? Sometimes your data files may contain features that our automated PCB Visualizer process cannot recognise. Or you may be worried that your first layout is not quite right. Whatever your concern, we can give you the reassurance you need. 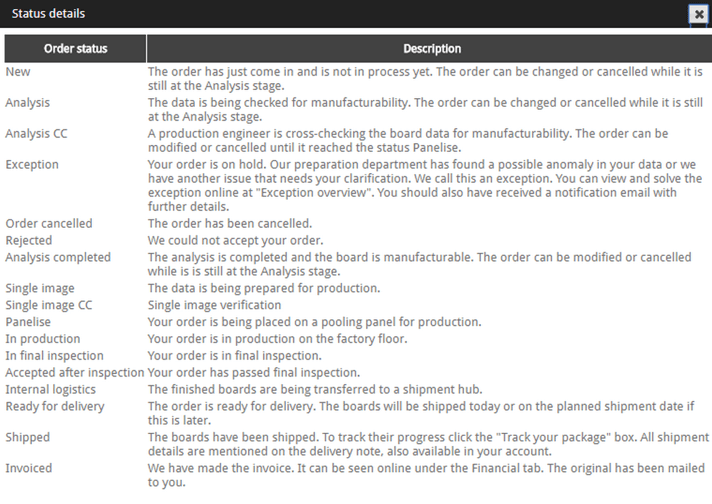 Set up an approval step for the production-ready data for your board just before it goes into physical manufacture. As soon as our engineers have completed their checks, we will send you an e-mail to advise you that the production files are ready and waiting for your approval. To set up a pre-production approval: go to “running orders” in your account and select a “request pre-production approval”. You can do this for every order in your running order list that has not yet reached the status “panelise” (from status panelise on it’s too late). The order will now also be listed under “pre-production approval overview” in the main menu (left column) in your account. The item is still in analysis, so not yet ready to verify the data. After preparation, the production-ready job goes into the customer’s pre-production approval (PPA) folder – “items ready for your approval”. You will receive our e-mail and need only 1 click to send the job on for manufacture. How? Go to “preproduction approval” – the status of your order is “waiting for your approval”. 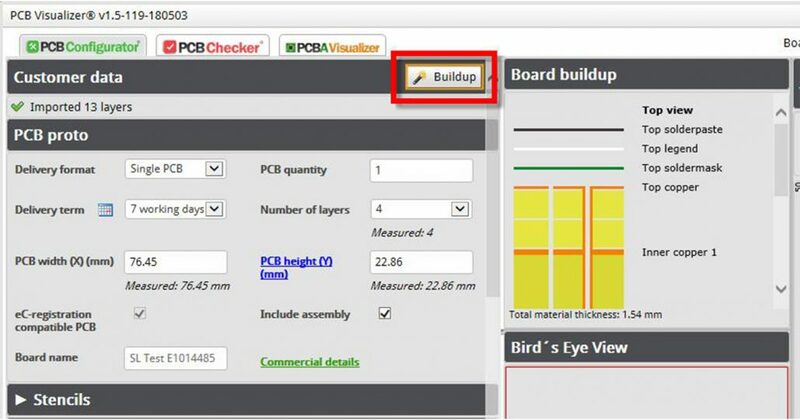 Have a closer look in PCB Visualizer: our production data of your PCB or customer panel is displayed on your screen (especially check technical options like internal milling, customer panel layout and other specifics). If approved, the order will be moved directly to our production panel section, no changes are possible after that. Ho do I upload new data to resolve an issue? The order is in “exception overview”. You can upload a new dataset via “view details” and using the button “modify”. The instructions are also given in the exception document which you can download to review all data issues. Reject the approval and explain in the message that you will send new data and why. Then send us the data right away and we will upload them for you. Need more time to redesign? Then we will move the order to “exception overview”. From there you can change many parameters and upload a new PCB dataset when ready. The delivery term will be recalculated as soon as the modification and data upload is done. See also: what happens if there is a problem with my data? Delivery terms is actually the number of days after we start production your PCB’s they are Shipped from our factory. The Delivery term starts the day after receiving the order, this is seen as starting at 00H00, thus if you order at 23H15 the Delivery term will start at 00H00 of the following day. Working days are Monday to Friday inclusive and excluding Public holidays. If a 3 day Delivery term is selected and the order placed at 22H00 on Monday, then the PCB’s will be Shipped on Thursday. IF a 3 day Delivery term is selected and the order placed on a Wednesday then the PCB’s will be Shipped on the Monday. The above applies providing the order was not stopped due to documentation, data or other issues. How can I add/change my Purchase References (PO)? You can add or change the purchase reference for an item in your shopping basket or for a running order until the status of the order says “Production Finish”. How to do this? Select the item or order and click the black button “edit administrative details”. Now you can add your references. It is important that these fields are activated to be shown in your account (sometimes they are hidden). If only the PCB name appears, please contact the power user of the account. He can activate these fields. (He can do this via “manage profile”). To place a repeat order first Sign In to your account. The select “CALCULATE AND ORDER” from the left-hand side menu, then select “Order repeats/view history” from the menu. This will display a history of your orders. To “Order a repeat” simply check the box on the left of the row for the specific PCB, then select the “Order a repeat” button at the top of the window. This will open the PCB Visualizer where you can review the details and prices etc. Once everything is correct select the “Add to basket”button and continue instructed. 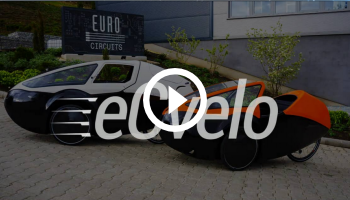 How does Eurocircuits deliver? Charge for delivery? Delivery is usually via a courier service, though other methods may be used as applicable. The cost of delivery is based on the estimated weight of the finished order and is calculated at moment the order is placed. For further information please see section 5 “Delivery” in our Terms of Sales. I forgot to order a stencil. Can I still do it later? You can order Stencils even after you have checked out and placed the order for the PCB, first Sign In to you account. Then select “CALCULATE AND ORDER” from the menu list on the left-hand side and then select “Order stencils”. 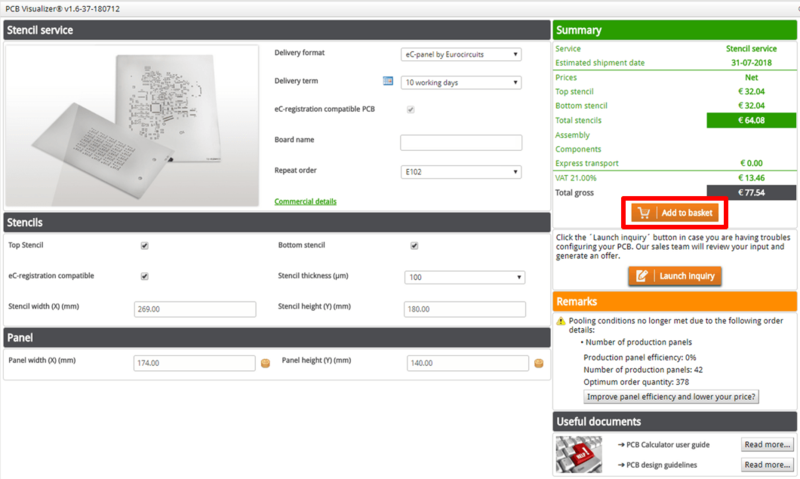 Next select “Price calculator” in the “Stencil order for an existing/ordered PCB” option. This will open a new window, click on the “Select” button corresponding to the order for which you would like to order Stencils. The “Stencil service” window will open, here you fill in the details for the Stencil(s) you wish to order and click the “Add to basket” button and follow the instruction. What happens if there is a problem with my PCB data? We have always run 100% pre-production checks on customer data. That way we can be sure you will get the board you want on the day you want it. Our online check software, PCB Visualizer, has significantly reduced the number of exceptions but there may be remaining data or order issues. The production-ready job goes into the customer’s pre-production approval (PPA) folder. He gets our email and needs only 1 click to send the job on for manufacture. How? Click the orange button “review for approval” – the document with the repair details/proposal/corrections will open automatically on your screen (if not, click on the grey button “repair details” to open it). Check our proposed “repairs” in the document. 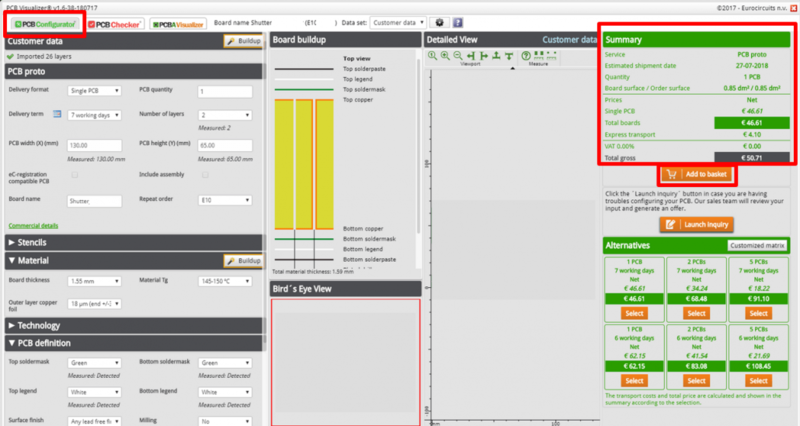 Have a closer look in PCB Visualizer: our production data of your PCB or customer panel (including the repairs) is displayed on your screen (especially check technical options like internal milling, customer panel layout and other specifics). If the detected PCB data issue is not “repairable” by Eurocircuits and no solution can be proposed, then we will raise an “exception” as we have always done. Go online to “exception overview” – check the problem, correct your data and upload your new complete PCB dataset. The delivery date will be recalculated at the moment when you upload your dataset. Do this as fast as possible to avoid any delay in delivery. The cut-off time for placing an order is 24H00, meaning that the delivery term starts at 00H00 of the next day. Where is my order? What do order status names mean? 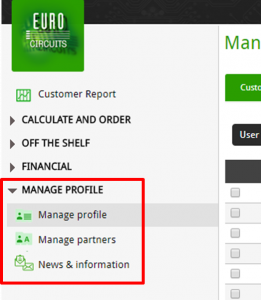 To track the status of your order first Sign In to your Eurocircuits account. Select “CALCULATE AND ORDER” from the left-hand side menu and then select “View running orders”. This will open a window with a list of all your running order and provide information such as Order number, PCB name, order Status and expected Shipment date etc. 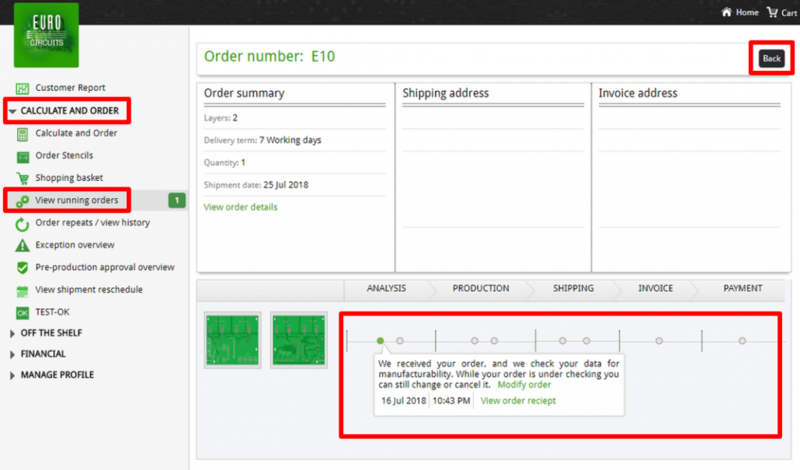 To check status of your order first check the box next to the order number, then select either the “History” button at the top of the window or click directly on the status in the order row. This will open a pop-up window where you able to see the status or your order, select the “Back”button to return to the “Running orders”overview. For a definition of the text in the “Status” column select the “Status details” button at the top of the window. A pop-up window will open listing all the definitions will be displayed. Yes, a final order confirmation is sent after the preparation of your PCB data is done and the data are ready for production. In case you have asked for a pre-production approval, we will send the order confirmation after your final approval to move ahead in to production. Can Eurocircuits manufacture blind/buried vias? How do I order them? Can Eurocircuits manufacture flexible PCBs? Can I get a Certificate of Conformity? For every PCB/Panel manufactured by Eurocircuits generate a PCB Passport, this details the materials, Production steps and Test Results etc. How do we assure the quality of your PCB? Can I order plated holes on board edge, round-edge plating etc. How do I define them? What approvals does Eurocircuits hold? Please follow the link below to see the Quality Labels held for each facility. What are available materials, board thicknesses, copper thicknesses, surface finishes? Where can I find the specifications of the materials?